Did I ever mention I spent a short stint of time living in Australia? It seems like a lifetime ago now. Way back when I was fresh out of my first degree, I had my graduation ceremony, and 4 days later had packed up and was on a plane to Brisbane, Queensland for an undetermined amount of time. The reason isn’t the typical “I want to see the world” before settling in to a career. Well, okay, maybe that was an underlying reason. But what I really left home to do was skate on a synchronized skating team. In Australia. I know. Not exactly the country that first pops into your mind when you think of winter sports. But you see, they liked to have skaters from “skating nations” come and join their team – it was a great way to connect with the rest of the skating world. Plus for me, it meant I had a chance of competing at the World Championships – assuming we won the national championships the year that I was there. It was a sort of gamble – this team had won many previous championships, but you never know what will happen. Fortunately, we did win, and I was able to travel back to Canada (of all places) to compete at worlds that year, in front of family and friends. Definitely something I will never forget! I lived with one of my teammate’s family while I was in Brisbane, paying room and board. I enjoyed many a tasty dish, some familiar to me, some with different twists on classics, and some that I had never had. I learned what a sausage sizzle was, that beetroot was an acceptable hamburger topping, and that eating peanut butter with something sweet like jam was just plain weird. I tried out vegemite (which I actually don’t mind), and never got the hang of calling ketchup “tomato sauce”. 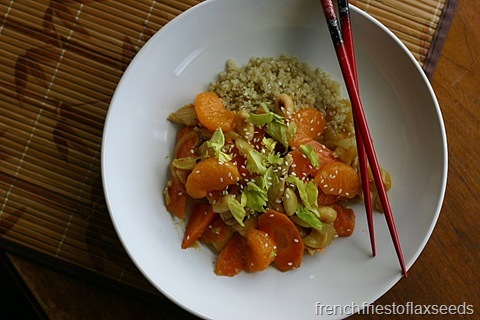 One of my favourite meals that my teammate’s parents made when I was there was this tasty stir fry with chicken, carrots, celery, almonds, and mandarin almonds. It was so simple and delicious – sweet and savoury, with a mix of textures. I made it my mission to learn how it was made, because it was one dish I knew I would need to make once I was back in the Great White North. There was never any recipe for this – I had to make it by trial and error to get it just right. The sauce has that nice balance of sweet and sour, but not like the bright red variety you get in westernized Chinese food. It’s fresh, bright, and so easy to make. I love that it only uses “staple” veggies, because it means I almost always have the ingredients on hand. The mandarin orange slices and crunchy toasted almonds turn something rather ordinary looking into something special. Honestly, I’m not entirely sure why it’s taken me this long to post the recipe. I swear, I’m not holding out on you! I’ve made it countless times, tweaking the seasoning to get it just right. It’s a total crowd pleaser – I think my sister’s exact words when I made it for her the first time were “It’s a keeper!” It tends to disappear pretty fast, I’m lucky if I have leftovers for lunch the next day…or if there enough left to take a decent photo. But the wait is over – so get out your pans and start cooking. 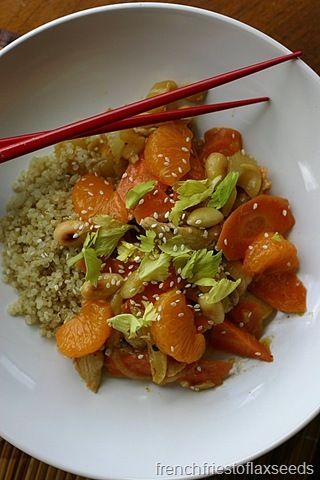 Sweet, sour, crunchy, and delicious! This family pleasing stir fry uses ingredients you probably already have in your kitchen to create a bright, fresh, and healthy dinner in a snap. Pair it with brown rice or quinoa for a satisfying meal. 1. Heat a wok or large skillet over medium heat. Add the almonds, and toast until golden brown. Remove from pan. Turn heat up to medium high. 2. Add oil to wok, and then add onion and garlic. Stir fry for 1 – 2 minute, then add chicken. Stir fry for 2-3 minutes. 3. 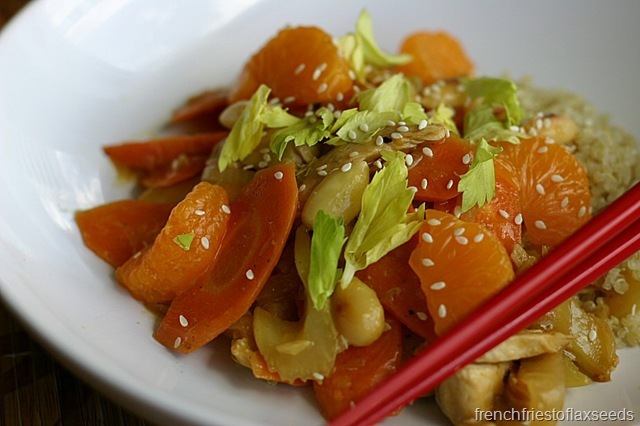 Add carrots and celery to wok, and stir fry for 2-3 minutes, until chicken is cooked and vegetables are cooked but crisp. Add the almonds back to the pan. Turn heat down to medium low. 4. In a small bowl, whisk together reserved mandarin orange juice, soy sauce, vinegar, corn starch, bouillon, sugar, and sesame oil. Add to wok, and cook until thickened. 5. 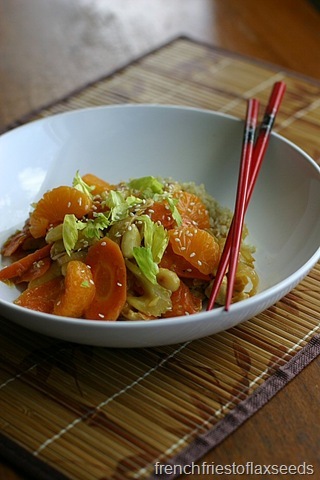 To serve, top with mandarin orange slices, and sprinkle with sesame seeds. Note: Don’t add the mandarin oranges until serving, otherwise they tend to fall apart in the stir fry. 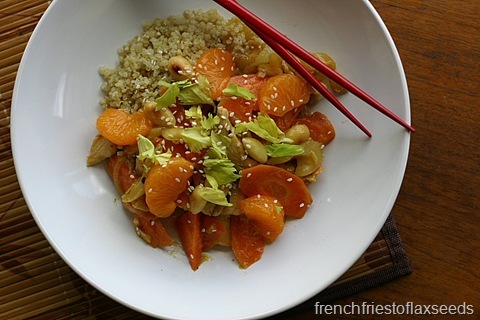 What do you like to serve your stir fry with – rice, quinoa, noodles, or…?